Material type: BookPublisher: New York Farrar Straus Giroux 2008Description: 32p. : col. ill.ISBN: 978-0-374-33499-4.Subject(s): 1. Refugees - Fiction | 2. Maps - Fiction | 3. Geography - Fiction | 4. 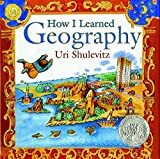 Shulevitz,Uri, 1935- - Childhood and youth - FictionSummary: As he spends hourss father's world map, a young boy escapes the hunger and misery of refugee life. Based on the author's childhood in Kazakhstan, where he lived as a Polish refugee during World War II. As he spends hourss father's world map, a young boy escapes the hunger and misery of refugee life. Based on the author's childhood in Kazakhstan, where he lived as a Polish refugee during World War II.